Welcome to our guide to the Frenchton/Frenchbo. 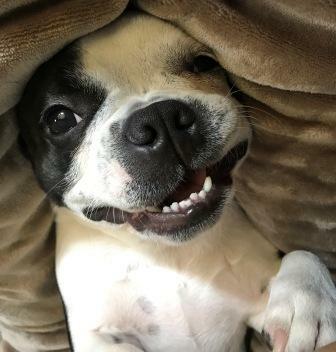 This cross between the French Bulldog and the Boston Terrier also has a few alternative names but they are all the same dog – you may also see Faux French Bulldog, Boston Frenchie, Faux Fr. Bulldog, Faux Frenchbo Bulldog. 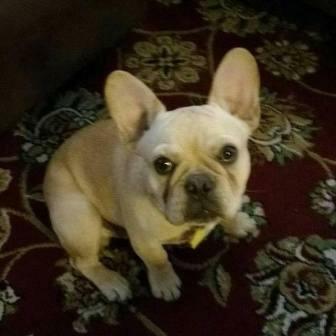 Nancy Bowen Rattigan: “Frenchtons are created by crossing a French Bulldog and a Boston Terrier. The puppies will resemble both parents, some leaning more to the French and the others to the Bostons. Generally speaking the females are smaller, usually around 20-25 pounds. If they are more like the Bostons, they may be a bit lighter. The males can be larger, usually more like 25 pounds to 35 pounds. These are GENERAL weights. I have seen MANY fit Frenchton males that are much heavier with no fat at all. And, I have seen females closer to 15 pounds. If they aren’t fat, then don’t worry. Many of the flat faced breeds (pugs, bulldogs, Cavalier King Charles, French Bulldogs, etc) have breathing problems due to Brachycephalic Syndrome. They cannot take air in adequately through their nostrils, indeed, many have to have surgical corrections. And, some have long palettes that must be shortened. These dogs snore and pant more often than their better designed relatives. Some drool! They must, therefore, be kept in moderate temperatures. That’s somewhere between 68 and 80 degrees, on average. They must have access to water on demand. You cannot leave them in cars or walk them in the heat for more than 15 to 20 minutes before heat exhaustion sets in. Because they are totally adorable, we sometimes forget that at the end of the day they really are bulldogs and than means stubborn dogs who can be quite fierce when they try to resource guard. It is quite frightening when you see those attacks. You must be stern and know how to correct them. Just because they are on the small side doesn’t mean they can’t inflict serious injury. It is suggested that pet insurance be purchased as soon as you get your dog. When they require veterinary procedures, it can get very expensive. Like so many other breeds, they can have serious back injuries. And, they should be walked with a harness as opposed to a collar due to their breathing issues. This breed is not recommended for novice dog owners. Though they are very popular right now, very few people have what it takes to really properly care for them. The DogExperts.info website aims to ask questions to breeders, vets and experienced owners to get the answers to your most frequently asked questions about the Frenchton/Frenchbo breed of dog. We would love to feature your dog and publish any photos or pictures of your Frenchton/Frenchbo you would like to email us. We would also like to build a list of Frenchton/Frenchbo breeders so if you know of any please send us the details so we can share them to help people looking to buy A Frenchton/Frenchbo. What in your opinion are the best things about the Frenchton/Frenchbo breed? Why do you think the Frenchton/Frenchbo is special? What are your favourite things about the Frenchton/Frenchbo? Are you glad you choose to buy a Frenchton/Frenchbo and not another breed? How would you describe the Frenchton/Frenchbo temperament? What advice might you give to people thinking about whether they should buy a Frenchton/Frenchbo over other breeds? What are the history and origins of the Frenchton/Frenchbo? What colors of Frenchton/Frenchbo are most popular? What does the Frenchton/Frenchbo look like? What are the pros/cons of the Frenchton/Frenchbo breed? What can a new owner expect in terms of differences between the Frenchton/Frenchbo and other breeds? What type of typical personality does the Frenchton/Frenchbo have? Is it possible to describe a fairly typical Frenchton/Frenchbo? What is the breed standard/description for the Frenchton/Frenchbo? Are there any downsides to owning a Frenchton/Frenchbo that prospective owners should be aware of? Is the Frenchton/Frenchbo breed of dog suitable for first-time dog owners? Some breeds can be described as greedy and prone to weight issues, would this apply to the Frenchton/Frenchbo? Is the Frenchton/Frenchbo breed suitable for a person or family that are out at work all day? Some owners seek a breed suitable for barking and offering a guard dog role – how does the Frenchton/Frenchbo match up to that role? Are there myths about the Frenchton/Frenchbo – in other words do new potential owners come to you with misconceptions about this breed? What types of questions do you get once owners get their Frenchton/Frenchbo home? What is the typical temperament of a Frenchton/Frenchbo, so people know what to expect from their new pet? When fully grown how much on average does a Frenchton/Frenchbo weigh? When the Frenchton/Frenchbo is full grown in size what is the maximum height and length expected to be? Is the Frenchton/Frenchbo ever crossed or mixed with other breeds of dog? Does the Frenchton/Frenchbo smell or drool a lot? Do you have a Frenchton/Frenchbo growth chart? What breed group does the Frenchton/Frenchbo come under? Are there some types of people that you can suggest the Frenchton/Frenchbo is not suitable for, perhaps families? How is the Frenchton/Frenchbo with children? Do you think the Frenchton/Frenchbo is suitable for families with young children? How does the Frenchton/Frenchbo get along with other (existing) pets and do you have any tips or advice for new Frenchton/Frenchbo owners in terms of successful integration? Is it better to buy one Frenchton/Frenchbo or two? Would the Frenchton/Frenchbo be suitable as a guard dog? Can I leave my Frenchton/Frenchbo during the day while I go to work? What is the expected average lifespan of the Frenchton/Frenchbo? In terms of life expectancy, how long on average would the Frenchton/Frenchbo breed live to? How to handle the Frenchton/Frenchbo puppy to start off – how much food, what type, how often? Do owners need to consider supplements for their Frenchton/Frenchbo? How much did your Frenchton/Frenchbo cost to buy? Can you offer advice to people looking to buy a Frenchton/Frenchbo and how much should they spend? What advice would you offer new Frenchton/Frenchbo owners? What types of people are buying the Frenchton/Frenchbo and why? Where can I buy Frenchton/Frenchbo rescue dogs or find a Frenchton/Frenchbo for adoption? Please note that buying or searching for a ‘cheap’ Frenchton/Frenchbo can be false economy as they may have health issues that cost you far more in the long-term – always buy from a good and responsible breeder! How would you describe the Frenchton/Frenchbo puppy to potential new owners? What types of owners are best suited to owning a Frenchton/Frenchbo? What inspired you to become a breeder and did you start with the Frenchton/Frenchbo? As a Frenchton/Frenchbo breed expert, are there any ‘essential’ tips you would like to share with new owners? How long does it take to housetrain/potty train a Frenchton/Frenchbo? We invite you to email us your Frenchton/Frenchbo’s pictures, in particular we are looking for photos showing Frenchton/Frenchbo puppies at 1, 2, 3, 4, 5, 6, 7, 8, 9, 10, 11 and 12 weeks old as well as early pictures such as 1, 2, 3, 4, 5, 6, 7, 8, 9, 10 and 11 months old to a year old. Do they have any nicknames or does the Frenchton/Frenchbo have popular names? If my Frenchton/Frenchbo is pregnant what might the litter size be? Could the Frenchton/Frenchbo be dangerous around young children? How do you prevent a Frenchton/Frenchbo biting? How do you prevent a Frenchton/Frenchbo chewing? How do you stop a Frenchton/Frenchbo jumping up? Does the Frenchton/Frenchbo have an issue with excessive digging? Why does my Frenchton/Frenchbo keep growling and barking? Is there a reason my Frenchton/Frenchbo dog is often scratching excessively? In comparison perhaps to other breeds what can you say about the Frenchton/Frenchbo and their exercise needs and do you have any tips or advice for new Frenchton/Frenchbo owners? As a breeder of the Frenchton/Frenchbo , do you prefer a collar or harness? As an expert of the Frenchton/Frenchbo breed do you prefer a standard leash or retractable? Can you offer any dog walking tips for Frenchton/Frenchbo owners? What games and toys can you recommend for the Frenchton/Frenchbo? How intelligent is the Frenchton/Frenchbo compared to other dog breeds? Do you have any special grooming routines or tips and advice for new Frenchton/Frenchbo owners? What accessories are required to be purchased for grooming a Frenchton/Frenchbo? How much do Frenchton/Frenchbo shed and how do I maintain their hair and how often? Is the Frenchton/Frenchbo a hypoallergenic breed? Any advice/tips you can give concerning cleaning and bathing your Frenchton/Frenchbo? Can you offer new Frenchton/Frenchbo owners advice concerning fleas and maybe products you use in treatment and prevention? What advice and tips could you offer to owners who might wish to follow your path in showing the Frenchton/Frenchbo? What started your interest in showing the Frenchton/Frenchbo? If a new owner perhaps wanted to meet other owners or find out more – perhaps they have an interest in joining a local club or maybe they wonder how they can start showing their Frenchton/Frenchbo – where would they begin? How would an owner know they have a show-quality Frenchton/Frenchbo and how would they start off? What official organisations are there for the new Frenchton/Frenchbo owner and what benefits or services do they provide? In buying a Frenchton/Frenchbo, can you offer advice and tips to new owners? How did you progress to becoming a breeder and why focus on breeding the Frenchton/Frenchbo out of all the breeds you could have chosen? What do you think makes the Frenchton/Frenchbo special to you? In comparison perhaps to other breeds what is it like to train a Frenchton/Frenchbo and do you have any tips or advice for new Frenchton/Frenchbo owners? How should new owners approach bringing a new Frenchton/Frenchbo home, any advice and tips you can give? Should I allow my Frenchton/Frenchbo to sleep in my bed or elsewhere in the house? Should my Frenchton/Frenchbo sleep in a kennel or crate? Health is always a major concern when buying a dog, do you have any advice for new Frenchton/Frenchbo owners to be aware of in particular? What is the recommended schedule for vaccinations for your Frenchton/Frenchbo? What type of health issues can a Frenchton/Frenchbo have and how do you deal with preventing these? Why does my Frenchton/Frenchbo have diarrhea? Why is my Frenchton/Frenchbo vomiting and do I go to the vets? When should I take my Frenchton/Frenchbo for vaccinations and which ones do they need and how often? How often will my Frenchton/Frenchbo be in heat? Should I consider getting my Frenchton/Frenchbo spayed or neutered and when and how much does this cost and what are the benefits? My Frenchton/Frenchbo is limping, what should I do and should I go to a veterinarian surgeon? Why is my Frenchton/Frenchbo not eating? 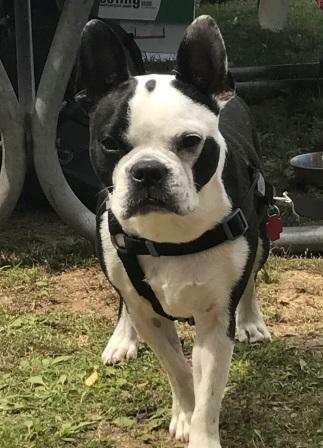 How much does it cost to insure my Frenchton/Frenchbo? What healthcare issues or diseases might be excluded from companies that provide Frenchton/Frenchbo dog health insurance? What age would you class as an ‘older or senior’ Frenchton/Frenchbo? What changes in food and diet would you suggest making for an older Frenchton/Frenchbo? Do you feed any supplements to an older Frenchton/Frenchbo – or anything else which helps them as they age? Are there any health issues particular to a senior Frenchton/Frenchbo dog? Do you have any advice for owners of an older/senior Frenchton/Frenchbo or tips you can pass on? Below we list breeders of Frenchton/Frenchbo dogs.